Viking Helmet | BUDK.com - Knives & Swords At The Lowest Prices! 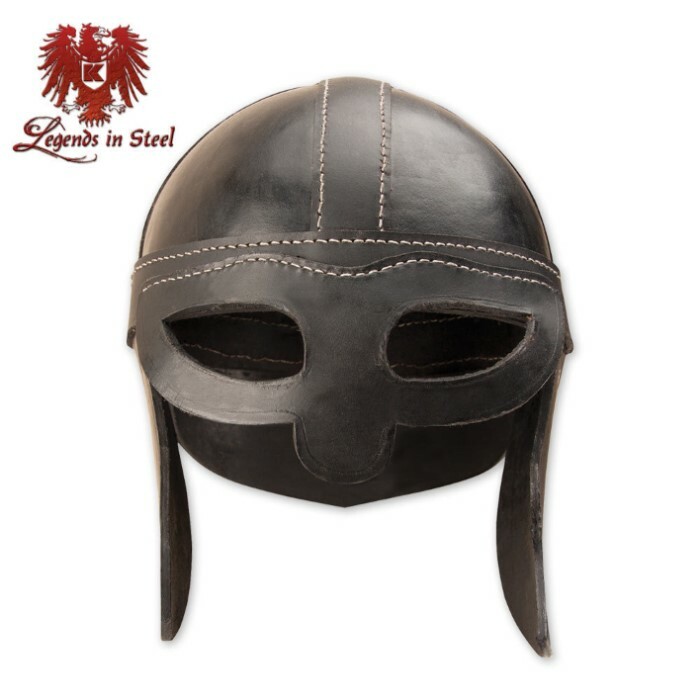 Little known to most people, leather helms were as common as metal helms in the medieval time period because they were a lot more affordable. This Viking helmet is made from high-quality, harness grade leather, dyed black. It is strengthened by various metal rivets and features a leather set of spectacles to protect the eyes and the bridge of the nose from slashes to the face. Hanging leather cheek plates protect the sides of the face and the top of the neck and a protruding beak on the back defends the nape of the neck. Perfect for re-enactors and collectors. Includes adjustable liner. Fits most adult heads.